Traction: time to union can be 12 weeks. Current research does not show an increased incidence of lung complications with reamed nailing (Anwar IA, CORR 2004;422:71). Reamed nailing increases union rates and decreases time to union (Bhandari M, JOT 2000;14:2). 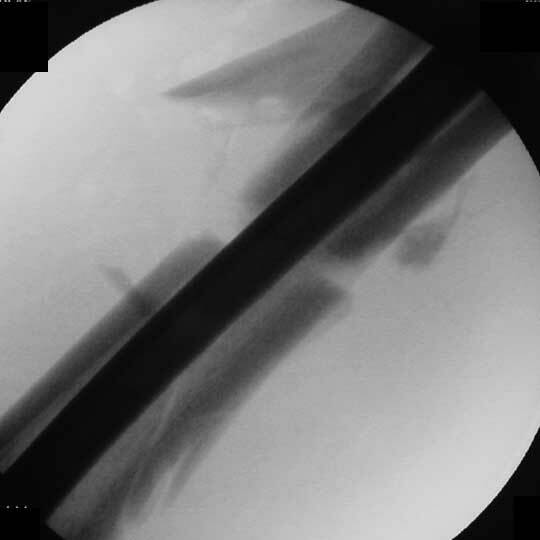 Conversion of External fixation to IM nailing of femural shaft fractures should be done within 2 weeks to decrease deep infection risk (Harwood PJ, JOT 2006;20:181). incision in-line & proximal to greater troch. Blunt dissect to piriformis fossa. 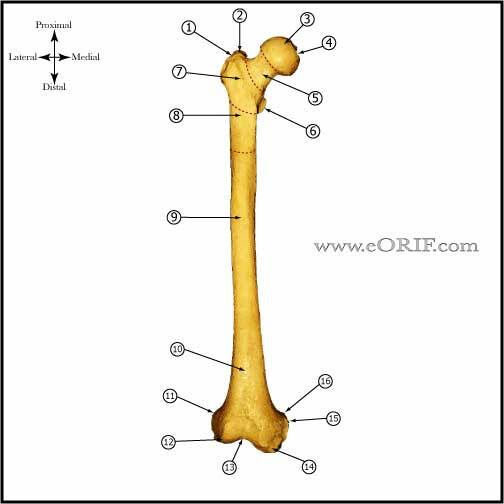 Insertion point is just medial to greater troch & post to central axis of femoral neck. Avoid anterior portals. Bend ball tip quidewire & insert/reduce fx. Ream to 1-1.5mm larger than nail desired. 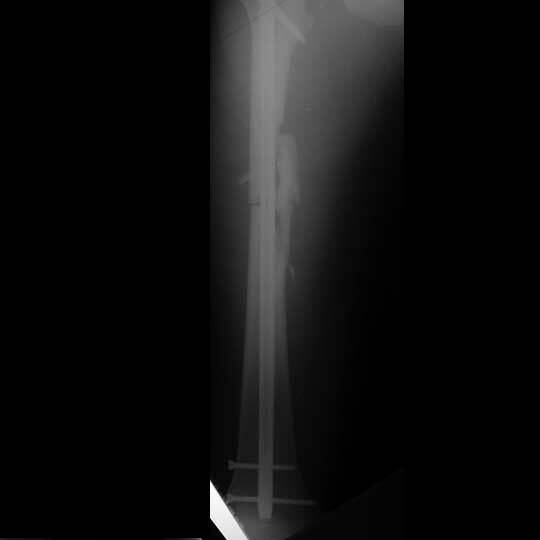 Ensure proximal femur is reamed to appropriate dimension for proximal diameter of nail. See manufactures instructions. Rotation of the nail 90º such that the anterior bow is apex medial, directs the tip of the nail centrally during insertion, minimizing nail comminution risk. 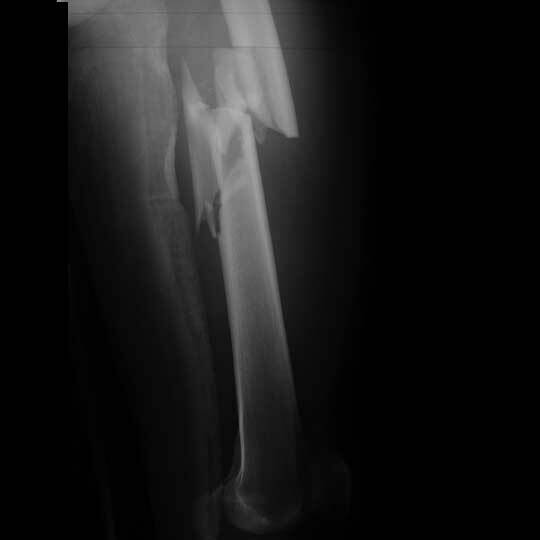 The nail is then derotated once the tip crossess the fracture site with gradual successive mallet blows. (Ricci WM, JAAOS 2009;17:296). Proximal hole=5mm drill 6mm screw. Distal holes =4.3mm drill,5mm screw for 10&11mm nail, 5mm drill & 6mm screw for larger nails. 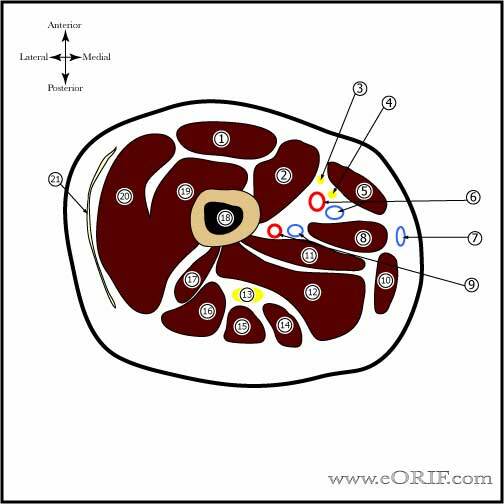 Evaluate leg length and rotation and make any adjustments necessary before distal locking. 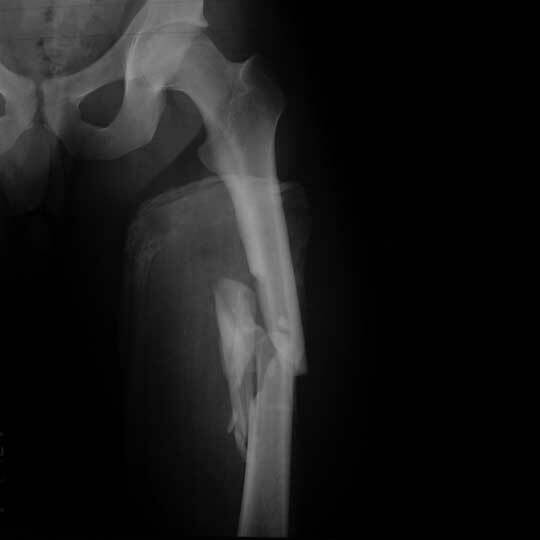 Evaluate femoral neck for occult fracture with A/P and lateral c-arm.